Ready? As I’ll Ever Be. My Final Two Weeks at Home. For my final few weeks before flying out I’ve found myself caught between trying to get myself as prepared as possible and trying to relax and make the most of being at home. This has lead to a weird mix of days where I’m getting a train halfway across the country to do a practice hike or visit friends and days where I don’t leave the house and watch back-to-back episodes of Friends. The one constant is the ever-growing mix of emotions building up in the pit of my stomach and the nagging feeling that there’s something I’ve forgotten to do. For my second and final practice hike before hitting the AT I chose a section of the Hadrian’s Wall Path. 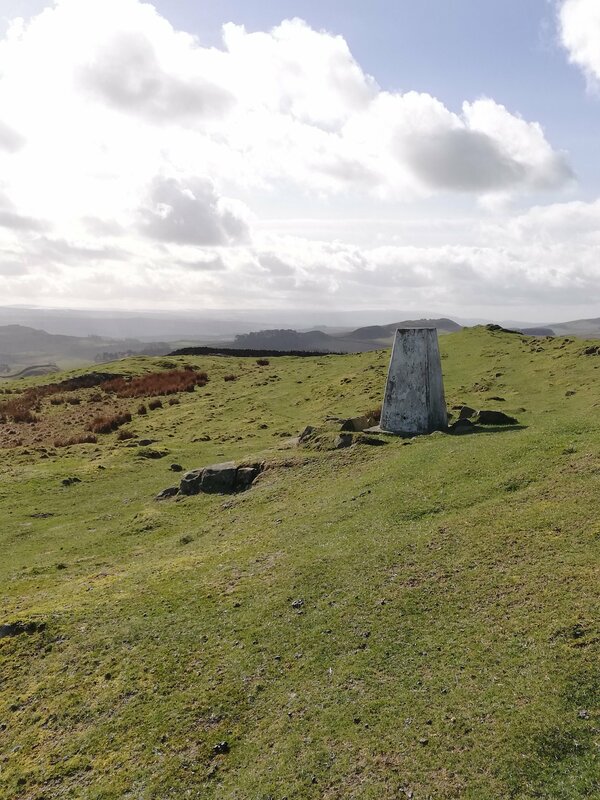 The 84-mile trail spans almost the entire width of northern England, following the path of the historic Hadrian’s Wall, many parts of which are still visible. I’d chosen this trail for two reasons. Firstly, it’s somewhere I’d never been before and wanted to explore. Secondly, it’s near Durham, the city where I went to university, so allowed me to combine trail practice and visiting some old friends. One of my favorite views in Durham. People who know me are probably very bored with me talking about how much I love Durham. If I owned a car I would say the same! I look back on my time there with incredible fondness. However, for a lot of the time I was there I did not enjoy it. In fact, a lot of the time I found it distinctly unenjoyable. 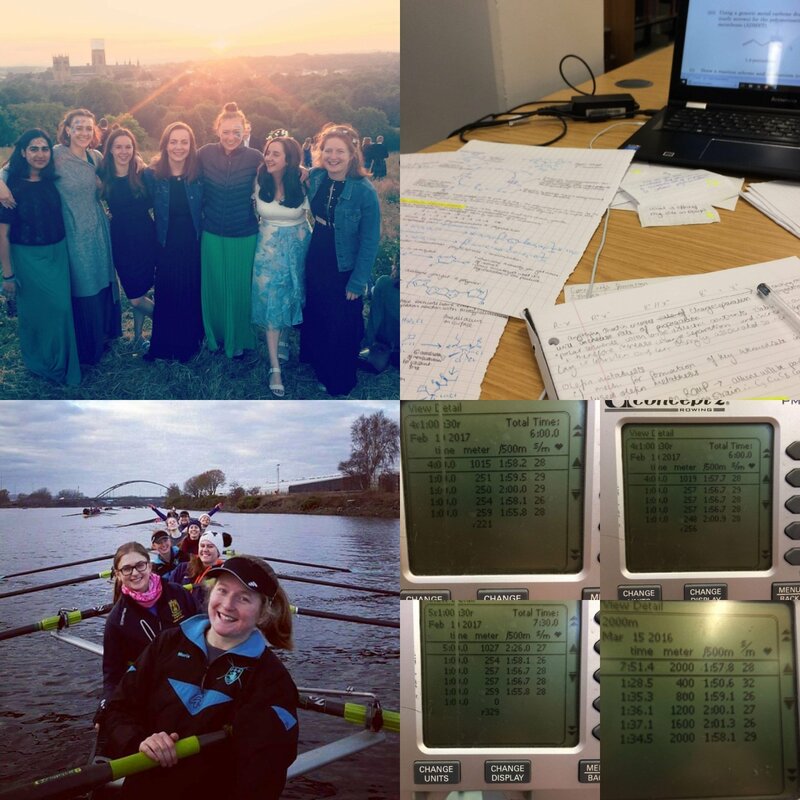 I found my course very difficult and overloaded myself with rowing-related responsibly, so was very busy and overtired 90% of the time. But now, I look back and appreciate the good times, the friendships and memories made and also the beauty of the city itself. I’m also proud of the achievements I made and challenges I overcame whilst at Durham, only some of which were academic related. I’m assuming my hike will turn out to be similar to this; a lot of the time it won’t be fun. It’s going to be hard work and at times I’ll wish I was anywhere but there. 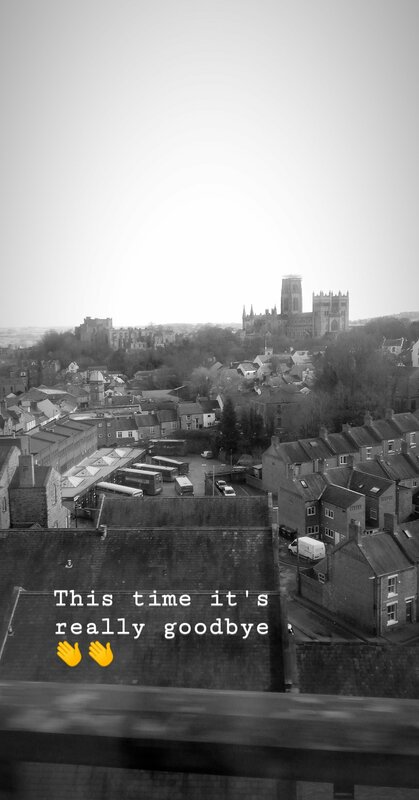 But at the end of it, if I can look back on the experiences I’ve had and the people I’ve met with anything like the fondness I now look at Durham with, then it will all have been worth it. Instagram vs reality. My memories of dressing up for balls and racing with my friends were only possible due to the hours spent in the library and in the gym. I spent an enjoyable day catching up with a few friends then had a 6 a.m. alarm set for the following morning. I’ve often thought that Durham train station must have been tactically placed to stop people from wanting to leave the city. It sits up a steep hill and has an unmatchable view of the iconic cathedral that dominates the skyline. I certainly did not want to leave, not knowing when I would next return. I therefore was feeling quite subdued as I rode the train toward Hexham. The fact that the sun had come out for what felt like the first time in weeks made me optimistic about the day ahead. From Hexham I took a bus to a tiny village named Wall that sits on Hadrian’s Wall. My plan was to walk from here to a campsite near the town of Haltwhistle, roughly 15 miles away, then walk the same route in reverse the following day. I’d hoped not to have to double back on myself but couldn’t find a route the correct length to bring me to a train or bus station at the other end. The purpose of this walk was to put myself and all my gear in a completely new location and see how we got on. I’d put some time into researching the trail but hadn’t really looked at the terrain. The first two miles of my walk ended up being along roads. Whilst not altogether unpleasant, there was definitely a moment when I started to worry whether I’d made a huge mistake and would be walking on tarmac all day. Finally the signposts started directing me across fields rather than along roads. 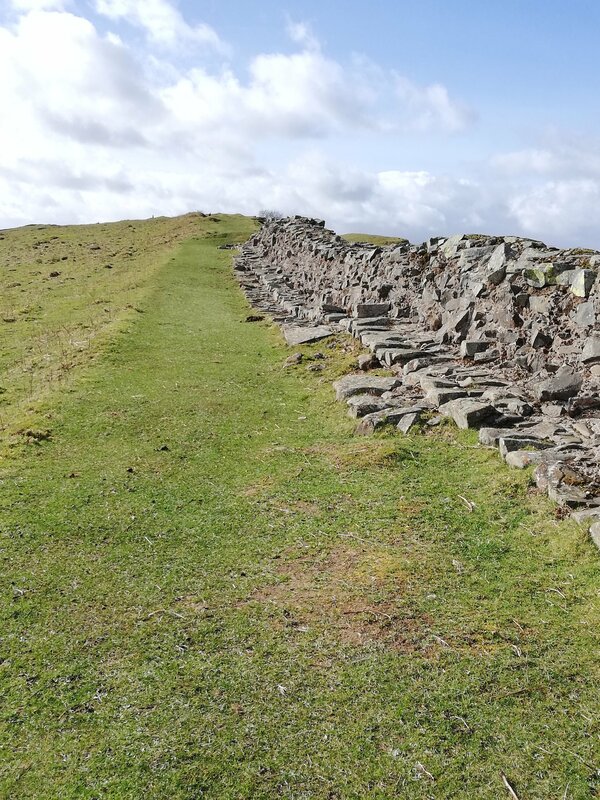 The next section of the trail comprised of crossing lots of relatively flat, muddy fields and eventually started to run alongside the remains of the historic wall. The relative easiness of the walking allowed my mind to wander to two nagging worries. Firstly, the wind. The wind has been very strong all over the country this week and I was expecting it to be quite blustery. What I hadn’t done was consider how much of an effect wind direction would have. The path I was following was going from east to west, horizontally across the country. On this day the wind was blowing from west to east in almost exactly the opposite direction to that which I was walking. This meant I was facing a headwind all day long. Although not a scarily strong wind, constantly battling the wind quickly became tiresome. Most of the walk was on quite exposed land so there was very little respite. The second worry was in my knee. From when I stepped off the bus that morning I’d noticed a small pain in my right knee whenever I walked up or down hill. As is my usual attitude to any kind of mild muscle pain I hoped that if I kept going it would probably go away eventually. To start with neither of these things were much of an issue. As the day went on the trail started to incorporate more ups and downs and was therefore more exposed. This exacerbated both problems. This was when I realized what this trip was going to be about. This trip was going to be my practice of hiking when hiking is no longer fun. It was time to test out some of my bad-day hiking strategies. Distraction. I often listen to music and podcasts when exercising but so far had been surprised to find that I could last quite a long time walking in complete silence. But this day I needed some help to keep going. I started with the couple of podcast episodes that I’d downloaded beforehand. I then moved on to a Spotify playlist called “Young Wild and Free,” which isn’t my usual music taste but the up-beat tempos and catchy lyrics make it good hiking music. Appreciating the scenery. There may not have been any jaw-dropping views but it was still a beautiful part of the world. Rolling green countryside stretched off as far as the eye could see and there were a few snowy hills in the distance. The wall itself was also interesting to look at with the remains of the occasional turret or chapel giving additional historical interest. Thinking of the alternative. Most of my friends were at work. Even the friends still living out my much-missed Durham life would probably be bored in the library, the lab, or lectures. The friends I’d seen the night before would probably be hungover if the rest of their evening had gone to plan. None of these are appealing situations. I may not have been having the best time but at least I was out doing something I wanted to do. It wasn’t exactly a bad place to be. As the afternoon drew on I started to pull out my map more and more often to try to judge how far I had left. This was the biggest difference to all my previous walks. Before, I had always been walking in places I knew so had a rough mental picture in my head of what was still to come. This time I only had the map to guide me and although I could work out how far was left it was very difficult to translate this into how far it would feel. After what felt like an eternity of short ups and downs, my sore knee and I were very grateful when we finally reached the campsite. Unsurprisingly, I was the only person camping at the site that night. I knew rain and wind were forecast overnight so tried to find the most sheltered spot I could. Checking my phone gave me a much worse weather forecast than I had been expecting. I’d previously been pleased to see that although strong wind and rain were forecast overnight these were supposed to abate in the morning, meaning I was hopeful to remain dry for the entirety of my trip. The forecast was now showing winds of at least 50 mph over night and throughout the following morning accompanied by an around 90% chance of rain from 9 p.m. until well into the following day. It was also saying thunderstorms from 8 a.m. I realized that I’d previously been checking the weather at my starting location and not at the campsite. Although only 15 miles away the forecasts were quite different. That being said, the forecast had also deteriorated in the starting location so it was not just my ineptitude that had let me down! There was now a yellow weather warning in place for flooding as the country was in the grips of what was being named Storm Gareth. Venting my feelings on Instagram. Throughout the afternoon I’d allowed myself to fantasize about ditching the hike in the morning and catching a train back to Durham to spend the day sitting in coffee shops and catching up with friends. But I hadn’t actually considered it as a viable option until I sat in my tent looking at the forecast. I ultimately made the decision not the hike back the second day. This was partly due to the weather and partly due to my knee. The pain in my knee hadn’t been excruciatingly painful but had been enough for me to know that something wasn’t right. I was pretty sure that if I wanted to I would have been able to walk the 15 miles back to Hexham on it. But why take the risk of damaging it further when I was now just over a week away from my AT start date? I know that when on trail I won’t be able to stop walking for every ache and pain, but the mental resilience I may have gained from walking one extra day on a bad knee would be useless if I did some long-lasting damage to my body. Similarly, when looking at the weather, I thought I probably would have been able to get through the day. There was only one exposed part of the path that I thought could be dangerous in high winds. But again, why risk it? 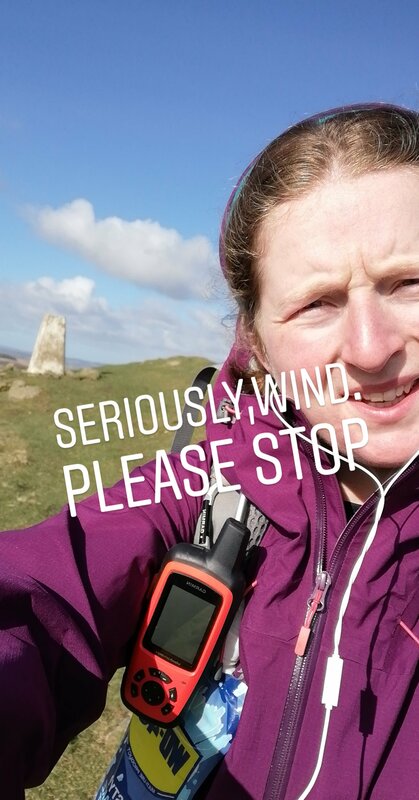 I’ll probably face worse weather on the AT but in this case there just didn’t seem to be any point in putting myself through a day that at best would be wet, cold and windy and at worst would be dangerous. Even though I’d made the decision to bail I still had over 12 hours before I could catch a train from the nearest village the following morning. Almost exactly at the time I lay down for the night the rain decided to kick in. The noise of the wind and rain combined to give me what I’d have to say was the worst night’s sleep I can remember having. Between 9 p.m. and 6 a.m. I checked the time on my phone at least once every single hour. I’ll often listen to audiobooks when struggling to sleep but the volume I had to turn my headphones up to in order to hear it made this a not very relaxing experience. At one point I decided to give up on the idea of sleep and listened to another comedy podcast. If I couldn’t be well rested, at least I’d be entertained. One thing I was never worried about was my tent. I couldn’t believe how well it was standing up to the test. Although there was definitely some shaking going on I never once thought that it was going to let me down. I’m still find it amazing that, although the rain fly doesn’t reach all the way to the ground, the inner doesn’t get wet. Cooking food was definitely the highlight of my day. Although “not walking” I still had three miles to walk to get to the nearest train station. This was a very wet experience. I’d decided to go along the road rather than across the very waterlogged fields but found that even the roads were starting to flood in places. 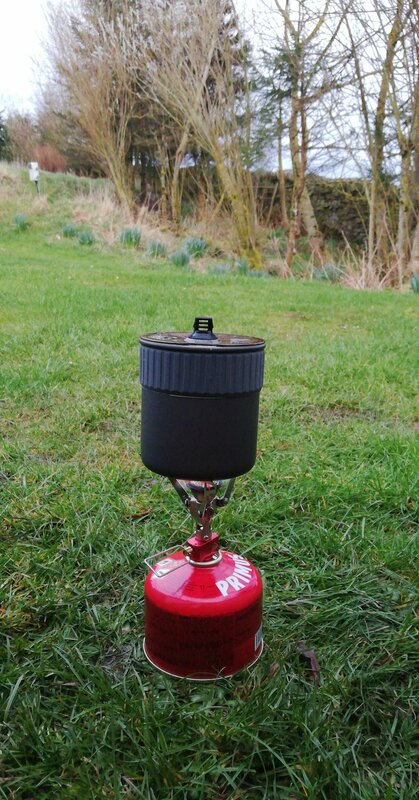 Although I’d walked as quickly as I could I missed the train I’d been aiming for as packing up my tent in the wind had taken longer than I’d anticipated. Thankfully there was another 20 minutes later. I made full use of the train’s heater to dry out my socks and shoes on the way back to Durham. My pre-booked train home from Durham wasn’t until 7 p.m. but I decided that the £28 cost of a new ticket would be worth it to get home earlier. Sadly most trains on this route cost £69 when bought on the day so it was still a four-hour wait until the next cheap train. I’d put out a plea on Facebook for any Durham-based friends to keep me company during this time, but unfortunately, it being midday on a Tuesday I hadn’t had much luck. Normally the idea of four hours to myself in Durham would fill me with joy. I could easily pass that time walking my favorite routes around the city and visiting my favorite cafes. But the whole point of today was that I wasn’t supposed to be walking. I was wet, smelly and had to tow a massive pack everywhere I went so knew I wouldn’t be welcome in many of the tiny coffee shops in the town center. This was the first time I’ve felt properly aware that Durham is no longer my home. I no longer have a house there. I’m no longer a member of the university so I couldn’t just walk in and sit in my old college. In the end a couple of friends did join me for lunch and I had a lovely few hours catching up on all their latest gossip. 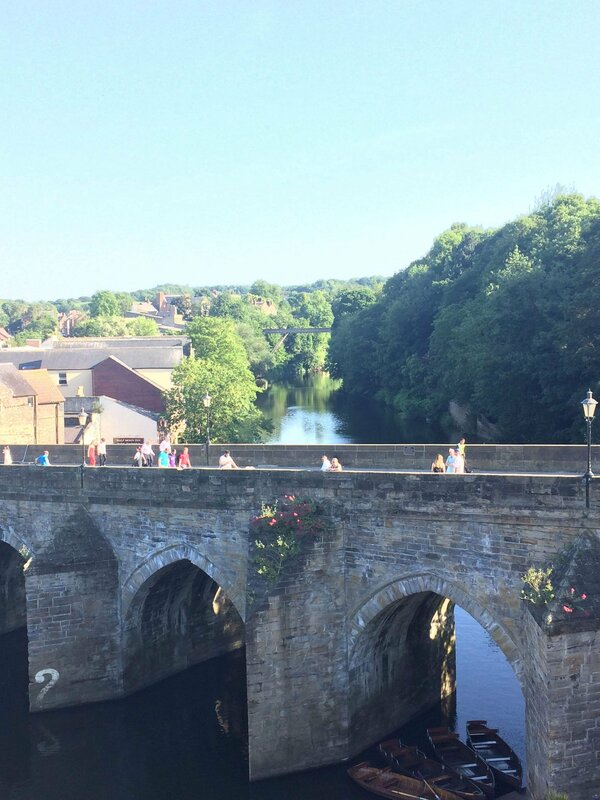 Even so, by the time I’d walked back up the steps to the train station I was thinking something I never thought I’d think: I was glad to be leaving Durham. The view of Durham castle and cathedral as the train leaves the city. Although Durham will always hold a special place in my heart I now think I’m finally ready to move on to my next adventure. I’m ready to find my new happy place. I can’t say whether or not the AT will be this for me, but there’s only one way to find out. The following day I had me knee looked at and although it is slightly inflamed there shouldn’t be a problem with me starting my hike next week. 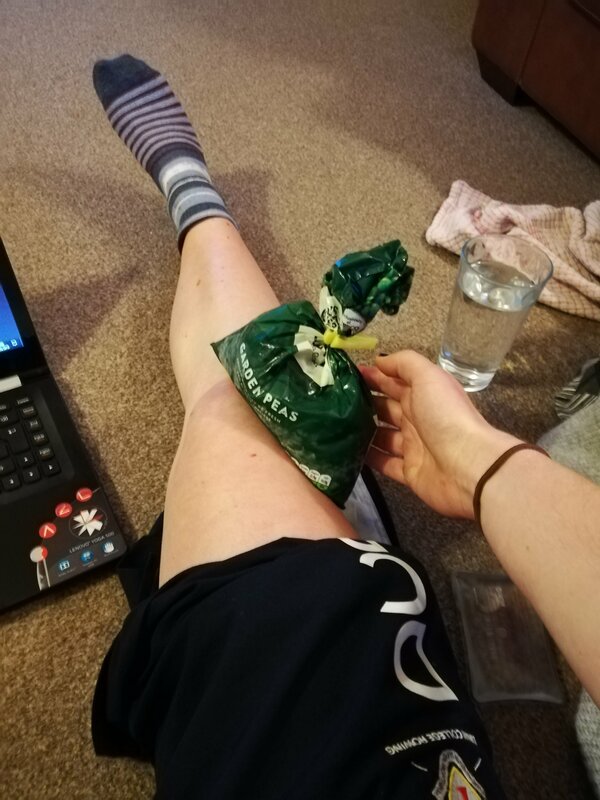 I’ve been prescribed some stretching and am using heat and ice on my knee to try and reduce the swelling. I picked March 21 as my flight date to allow me to compete in a rowing event in London before leaving. Unfortunately, the wind from earlier in the week had not abated so this rowing event ended up being canceled. This was disappointing as we’d put in a lot of work to get a crew together for it. However, I don’t think it was completely wasted. Training for that race probably kept me sane this winter as it gave me something else to think about other than obsessively preparing for my hike. As it goes I’d already booked my train tickets to London so got to spend the whole weekend eating and drinking with some of my closest friends. Saying goodbye to them this morning so I could head home for my final days of preparation made it all feel very real. Not how I’d hoped to spend my last few days before the trail. Tomorrow I’m getting me knee checked over and also getting a checkup at the dentist. On Wednesday there’ll probably be some packing going on and a fair bit of panicking. Thursday morning I get on a plane. Hi, I'm Lucy and I'll be heading NOBO on the AT starting in late March 2019. I've just finished a Masters degree in Chemistry and have decided to go for a little walk before starting my grad job. Coming from England I'd never heard of the AT until I stumbled across it online whilst planning my gap year. From that moment on I knew I had to give it a try! As a backpacking novice the learning curve is going to be steep but I am super excited to get out into the mountains and see what it's all about! Having a bit of a catch-up here- I really like this post. I love how forthright you are about the decision (a sensible one!) to stop before you meant to- I think a lot of people are quite bad at that. I certainly feel like I have to justify myself to myself, which is nonsense, and sometimes straight up dangerous, as you say. I also really like the way you talk about Durham. I had a lot of friends who hung on at my university to do MAs and DPhils, and I ended up loitering around visiting them for years, which made the separation quite slow and awkward- much better to treat it like the last episode of Fawlty Towers, and accept it was good, and now it’s over.